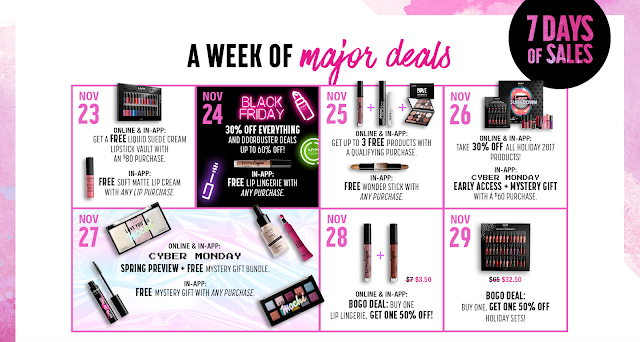 Black Friday + Cyber Monday 2017 Beauty Deals & Steals! First off before you even shop these sales, sign up for EBATES if you haven't already. Your first order of $25+ earns you a $10 gift card plus each time you shop you earn cash back. For Black Friday, they're offering up to double cash back! 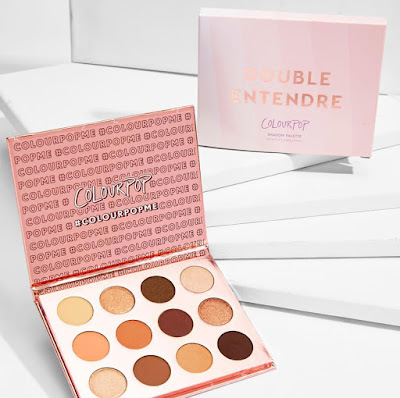 You won't find smaller indie stores on EBATES but here's a few that do offer cash back: Macys, Sephora, ULTA Beauty, Nordstrom, Tarte Cosmetics, Too Faced Cosmetics etc. They now also offer cash back for in-store purchases as well for a few stores! Full-size liquid lipsticks on sale for $13. Minis are 50% off at $3. 40% off online and 50% off in-store. Starts 11/24. 50% off all contour, eyeshadow singles, concealers and blush trios. 40% off all glow kits, liquid lipsticks and lip glosses. 30% off all matte lipsticks and darkside liner. 20% off all brow products, brow tools and brow brushes. Plus free brush with purchases over $75! Starts 11/24 Midnight EST/8am GMT. Ends 11/28 Midnight EST/8am GMT. The Nicole Gurriero Glow Kit will be back in limited quantities at 11/27 at 10am PST/1pm EST and it will be 40% off! 30% off site-wide. use code BLACKCAT. Starts 11/23 12am CST. Ends 11/26 11:59pm CST. 50% off all Silky Matte lipsticks, No code needed. Ends 11/28. Sold out items will restock 11/23 10pm EST. At this time the Disco Lip Double Dare Duos in limited quantities will launch as well as the Modify liquid lipstick adjuster kit. 30% off. Starts 11/24 Midnight EST. Ends 11/27 Midnight EST. 20-50% off site-wide. No code needed. Starts 11/23 Noon-11/27 11:59pm EST. 30% off everything and FREE domestic shipping. No code needed. Now through 12/10. Click the link to see all the exclusive Black Friday mini kits and other deals. 40% off complexion favorites. No code needed. Spend $50 for free shipping and FREE unreleased glitter lipgloss. Spend $100 and also get a FREE unreleased glitter quad. Up to 60% off sitewide (some exclusions apply). 30% off. Use code FRIDAY. 40% off everything. Use code BLACKFRIDAY. Ends 11/27. 30% off everything. No code needed. Includes bundles. All sales final. Starts 11/24 12:01am PST/3:01am EST. Ends 11/27 11:59pm PST/2:59am EST. 20% off sitewide. 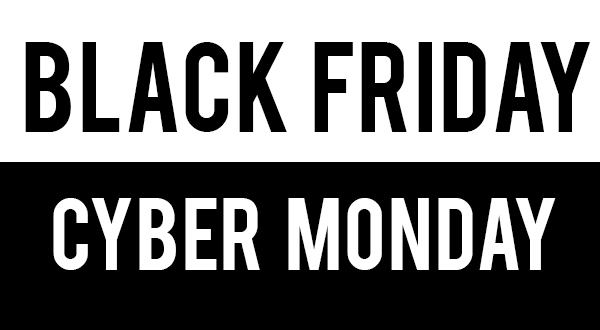 Use code BLKFRIDAY. Ends 11/26 11:59pm EST/8:59pm PST. 25% off and FREE shipping. No code needed. Black Friday Best Seller Tote. Only $50 ($125 value). Limit 3. 40% off everything (excluding value-packed gift sets). Ends 11/25. Cyber Monday: 50% Off Sitewide + Free Shipping! (excludes value-packed gifts) 'online only'. 20% off sitewide. Use code BLKFRI20. Ends 11/24 11:59pm CST. BF Sneak Peek: Up to 40% off everything plus FREE Hair Milk Original with $40+ purchase. 40% off sitewide and FREE U.S. shipping. 25% off any order. Use code 25OFF. Must have: 98¢ hot pots! 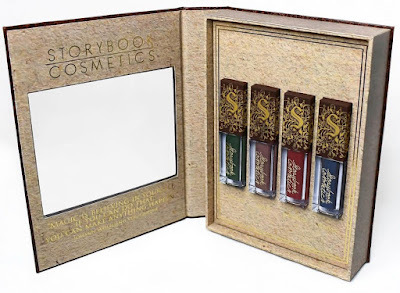 (See swatches of my collection here.) Buy some now and thank me later! All liquid lipsticks $4. Starts 11/23 9am PST/12pm EST. 20% off all palettes. Use code BestPals. Starts 11/24 9am PST/1pm EST. Extended until 11/27. Cyber Monday: Up to 30% off sitewide. Ends 11/27 11:59pm PST. 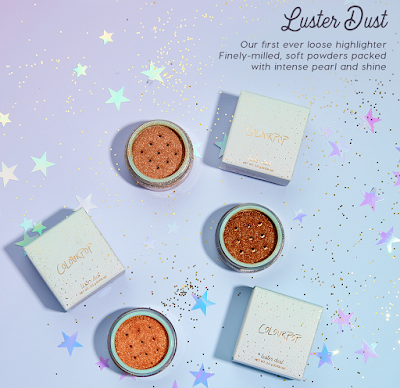 New Luster Dust (loose highlighters) dropped with 30% off! 25% off sitewide. Use code FRIDAY25. 40% off entire site. Plus up to 70% off select items. Starts 11/23 at 5pm CST. Ends 11/25 11:59pm CST. 50% off lip veils (excludes bundles). Ends 11/27 11:59pm PST. Save 25% off sitewide. Use code GIVE. Ends 11/23. Save up to 25% off sitewide. Use code SAVE. 50% off. Use code BLACKFRIDAY17. 11/23-11/28 Midnight. 40% off all lip products, Mint for You and Design x Katy. No code needed. Ends 11/26 11:59pm PST/2:59am EST. 50% off sitewide with code CELEBRATE on orders $30+. Exclusions apply. Plus, get free shipping on orders $25+. Ends 11/27. 50% off all lipsticks and 20% off everything else. Limited edition and limited quantity Black Friday black liquid lipsticks will be available. Starts 11/23 12am CST. 50% off sitewide. Use code BLACKFRIDAY. Ends 11/27 Midnight EST. 30% off your order. Use code BLKFRIYAY. 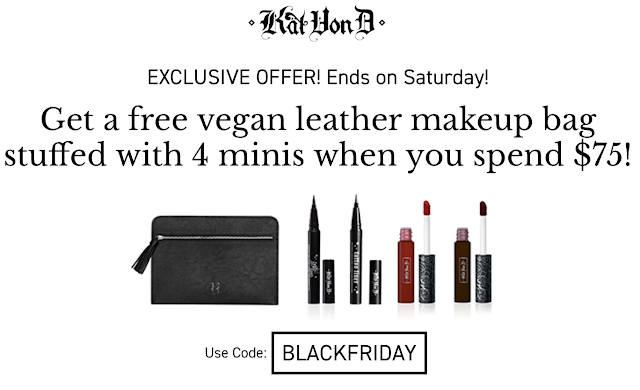 Ends 11/24 11:59pm PST. 30% off sitewide (excludes sale items) plus FREE shipping (domestic and Canada). Use code CYBERMOOD. Ends 11/28 11:59pm PST. Awesome markdowns sitewide as well as discounted bundles. 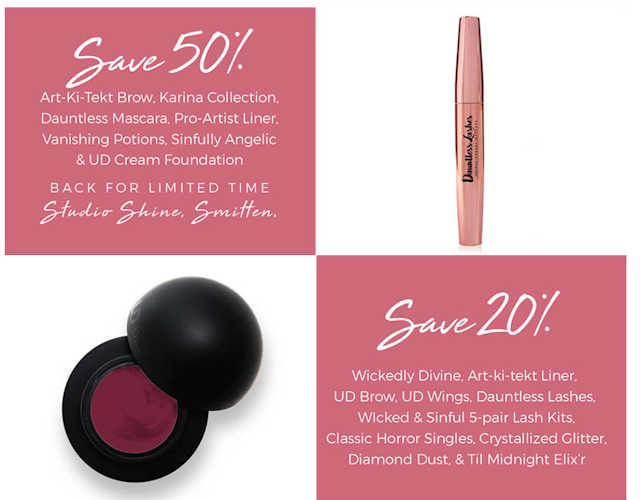 Plus save an additional 10% on top of sale prices with affiliate codes (try LISA or DUPETHAT). 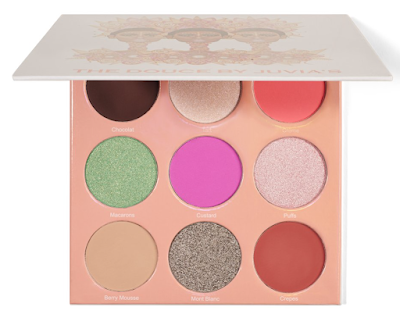 Cyber Monday: their new Douce Palette dropped! Cyber Monday: Get a FREE mini compact mirror when you spend $50. Use code CYBERMONDAY. Buy 3, Get 3 FREE. Add 6 items to your cart and the 3 lowest priced items will be deducted from your total. Ends 11/26 6pm EST. 30% off with code BF2017. Ends 11/26 11:59pm PST. 20% off any order. Use code FRIENDS. Cyber Monday: 50% off sitewide. No exclusions. Plus FREE domestic shipping as always. Up to 85% off sitewide. Velvetines starting at $3! 50% off all eyeshaodows and pan highlighters. Use code BF17. Limit of 1 per shade per order. 70+ past shadows and highlighters will be returning! Starts 11/24 at 8am CST/6am PST/9am EST and ends at Midnight CST/10pm PST/1am EST. 25% off online with code MAC25 and 11/23 in free standing Mac stores for Select members (it's free!). Select Obsessed members receive one FREE full-sized Bold and Bad Lash Mascara with $75 purchase after discount. Ends 11/27. 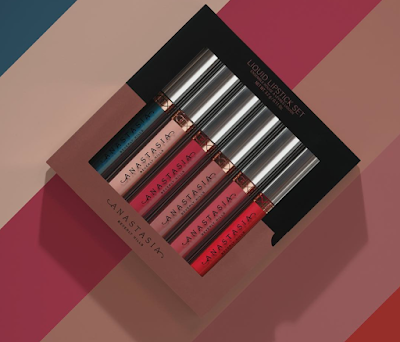 Cyber Monday: With purchase of $50 (after 25% discount is applied), receive one free Lipstick in Cyber, one free Lip Pencil in Cyber World and one free Black Neoprene Makeup Bag. Lipstick in Cyber, Lipstick in Cyber World and Black Neoprene Makeup Bag are subject to availability. The sales and doorbuster are all available online. Click the link and check out all the great offers. 30% off sitewide. Use code FRIDAY. 30% off sitewide. Now through 11/27. Up to 40% off select items with free shipping on $35+. FREE exclusive BF mini lip topper included in all orders $65+. Starts 11/24 Midnight PST/3am EST. Ends 11/27. Buy one, get one FREE on all mascaras. Up to 60% off sitewide. Starts 11/24 12am PST/3am EST. Ends 11/25. Sale extended through 11/27. 25% off sitewide. Use code FRIYAY. Ends 11/24 11:59pm PST/2:59am EST. Free shipping over $50. Use code SHIPYEAH. 40% off sitewide. No code needed. Starts 11/23 at 12am CST-11/27 Midnight CST. Click the link and check out all the great offers. 30% off online and in-store. Starts 11/24. Up to 50% off sitewide. No code needed. Ends 11/27. 11/23: FREE domestic shipping and FREE Glam and Go bag on orders $30+. 11/24-11/27: 40% off sitewide with code DEAL40. FREE shipping. No minimum. Click the link to see all the discounted offers. Buy one, get one FREE. Use code vipbogo2017. Ends 11/24. Save $30 off $100. Use code thankfulsavings. Ends 11/26. 40% off storewide for in-store locations. 40% off sitewide. No code needed. Free shipping on $25+. Ends 11/26 11:59pm PST. The Q-Redew is a handheld hair steamer. I recommend this especially for natural hair. Black Friday Early Bird Sale: $20 off with code BLACKFRIDAY. Ends 11/24 Midnight. $10 off with code SHOPSMALL. 11/25-11/26. 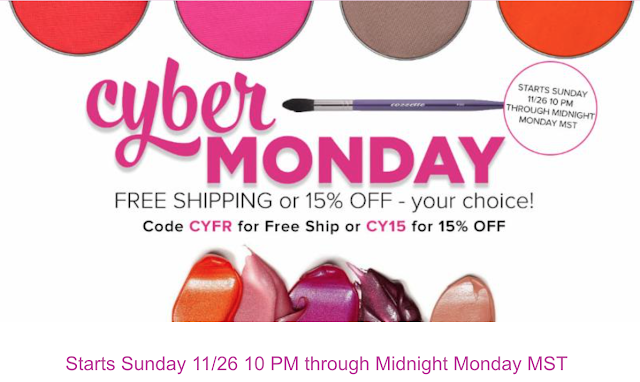 $15 off with code CYBERMONDAY. Ends 11/27. 25% off your entire purchase. Use code GIVETHANKS. Now through 11/27. Cyber Monday: 30% off sitewide on $20+. Use code CYBER30. 30% off all orders over $10. Use code CYBERWEEKEND. Ends 11/27. 75% off select NYX items too! 40% off everything. No code needed. Starts 11/24. 50% off everything. Ends 11/24 11:59pm EST. Sale extended! $15 special beauty sets and products like 12oz Purity Made Simple Cleanser. RUN!!! 20% off $50+. Use code BUY20. 30% off $100+. Use code BUY30. 40% off $200+. Use code BUY40. Ends 11/23 at 8:59am CST. Select US Black Friday shipping at checkout for free domestic shipping. Select a2o items priced $3.50-5.00 are on sale for $1! They are an online beauty $1 store (except for their a2o items, which are priced higher). 25% off when you spend $50. No code needed. 20% off all brushes. Use code BLKFRI17. 60% off sitewide. Use code BLACKFRIDAY. 20% off sitewide (excludes licensed products ie. Mean Girls and Charlie and the Chocolate Factory palettes). No code needed. Ends 11/24. 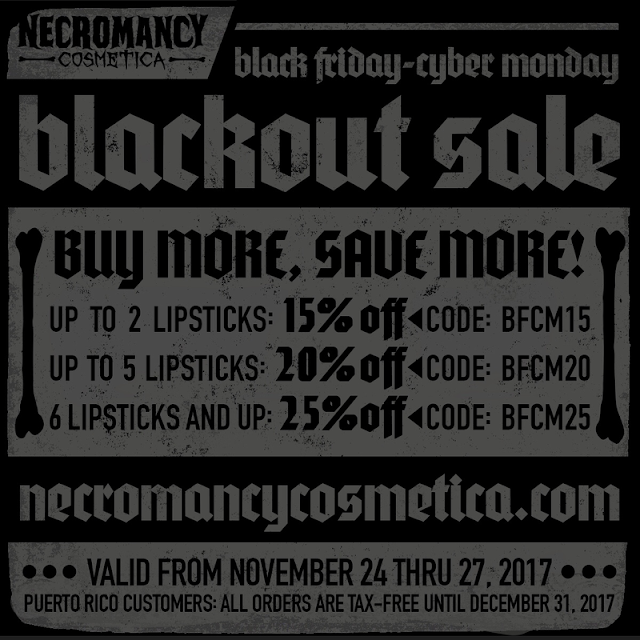 Cyber Monday: Wizardry & Witchcraft lipsticks and t-shirt promo. More details coming soon. Starts 11/23 10am PST/1pm EST-11/27. 30% off sitewide (excluding bundles). No code needed. Ends 11/27. Early access for Red card members starts 11/22. Early access. 25% off and brand new arrivals. Use code PREVIEW. 25% off. Use code FRIYAY. 11/24 only. 25% off (some exclusions like the Shape Tape concealer). Code WKND. Buy any full size BTS mascara and get the second item 50% off using code PINKFRIDAY. Buy any 2 Melted Matte for $30 using code MELTME. 25% off select items (excludes sale and new). Use code GIVEME25. Extra 50% off sales items. Click the link and check out all the great offers! $10 off $25 NYX purchase. Online code 501976. (Coupon available for in-store use as well. $10 off $50 qualifying purchase. Use code CYBERMON17. 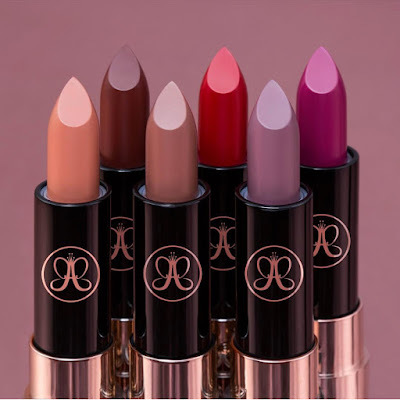 Deals include $2.99 Revlon Super Lustrous lipsticks, 50% off Lime Crime Velvetines, 40% off select Anastasia Beverly Hills Glow Kits, 30% off Makeup Revloution and more. Click the link for the sale preview. 25% off and FREE shipping. Use code LETSCYBER. Ends 11/25 11:59pm PST. Extended until 11/26. FREE shipping on $40. Use code SHIP40. $15 off $100. Use code 15OFF100. FREE Black Friday tote and mini bag with purchase. While supplies last. 35% off sitewide. Use code BLACKFRIDAY35. FREE highlighter trio on all orders $25+. Ends 11/26 11:59pm PST/2:59am EST. 20% off fan favorites. use code WILDFAVS20. Ends 11/22 11:59pm PST/2:59pm EST. Spend $20, receive a FREE mystery bundle. Use code BLACKFRIYAY. While supplies last. 30% off select styles. Starts 11/24. Save 20% off with code ZFS2017. Starts 11/24 10:30am CET-11/25 10:30pm CET.